My soul is calling for rest. I need to sink down into the earth, into my body, and into my home to reflect, recharge, and regenerate. I need is to pay attention to the wisdom of Scorpio, the season of death. Every year, this season hits me the same way—as a wakeup call to stop what I am doing and go deeper. How do I suddenly slow down, stop the manic activity in my life, and begin to notice what is really important? Scorpio demands we remember we are mortal, that we are ultimately compost. And that knowledge puts a whole new spin on how we fill our days. Scorpio is a Fixed sign and so has a special link to the other times of the year represented by the other Fixed signs: Taurus, Leo, and Aquarius. In contrast to Leo, the mid-summer season of creativity and expression, Scorpio time— inward, brooding and soulful—can hit us like a slap in the face. It is time to shift focus. I attended Barebones last night, an annual Halloween outdoor puppet show. This year, the show began with the audience being told that we were all dead and gathered there for an orientation for the newly deceased. Our amusing guide told us that the first question that everyone always asks is, “Am I really dead?” It’s always good to check. We were reminded of the five stages of grief, one of the first being denial. Really? Am I really dead? Who knows what our actual deaths will be like, but I imagine it could be a bit of a shock to change realities so quickly. If we need a reminder, Scorpio shocks us into realizing that we are indeed mortal, and that below the surface of things, there is an immense underworld of experience and reality we should pay attention to. Coming from the busy activity of summer and early fall, we may have forgotten all that. The underworld really isn’t all doom and gloom. It is a place of rich resource and treasure. Yes, death resides there, but also regeneration. The wisdom of Scorpio is that remembering our mortality, we claim our power to transform and enjoy life in a deeper, richer way. This pause between the worlds of Leo and the next Fixed sign, Aquarius, enriches the possibilities inherent in those other signs. The exuberance of summer loses its shine and the inspiring visions of winter are dull without this season of dying. The relationship between Scorpio and Aquarius is particularly meaningful right now. Aquarius is ruled by Uranus—the force of revolution and reform. Scorpio is ruled by Pluto—god of the underworld. We are living in a time of profound transformation as Uranus squares Pluto for the next four years. Squares are challenging and they are fertile. Collectively and individually, we are invited to develop sustainable practices that will acknowledge the deep truths of Scorpio while holding the visions of Aquarius. How will the world look at the end of the next four years? What are you committed to creating? Who are you committed to being? Our individual choices will create that world. 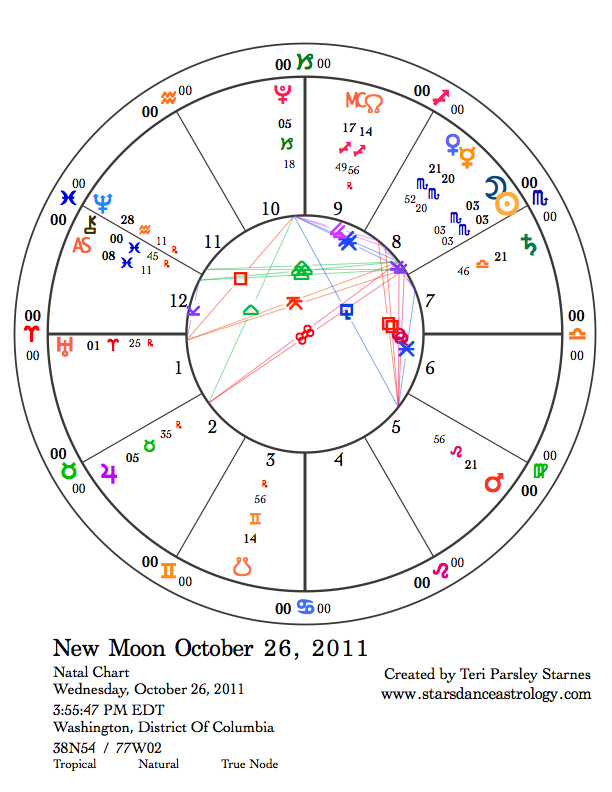 The New Moon chart. Jupiter entered Taurus, Fixed earth, in June. 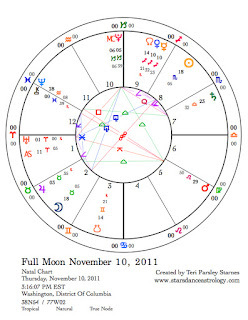 It opposes the Moon and Sun in this chart. Oppositions create perspective so this is a good time to access what Jupiter’s transit of Taurus means to us at this moment. The seasons of Scorpio and Taurus represent the cycles of death and rebirth. Through Taurus, we get in touch with our gardens, our bodies, and everything that gives us comfort and pleasure. What is your relationship to the physical world? How does it feel to be embodied while becoming aware of your mortality? Jupiter in Taurus places strong emphasis on the need to care for our bodies and to create sustainable lives that bless those who have made these lives possible, our ancestors—the beloved dead. Death and life are linked. 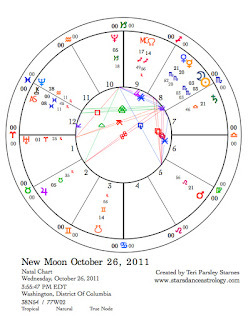 Another component of this chart is Mars in Leo square to Venus and Mercury in Scorpio. This recalls the theme of Fixed sign squares—the clash of worlds that fertilizes change. Tensions exist in our intimate relationships. Misunderstandings can arise between what we desire and how we defend those desires. Can our friends and lovers be trusted? Are egos bruised, needing reassurance that we are important to others? This frisson speaks to the authentic desire to be in partnerships that acknowledge who we really are and that support us even when we are afraid. Neptune is stationing direct this month and thus will be a stronger energy for sensing what is on the other side of the veil between this world and the other. Dreams and intuition, as well as grief and disappointment swell up, especially those times when Neptune is in aspect with other planets this month. 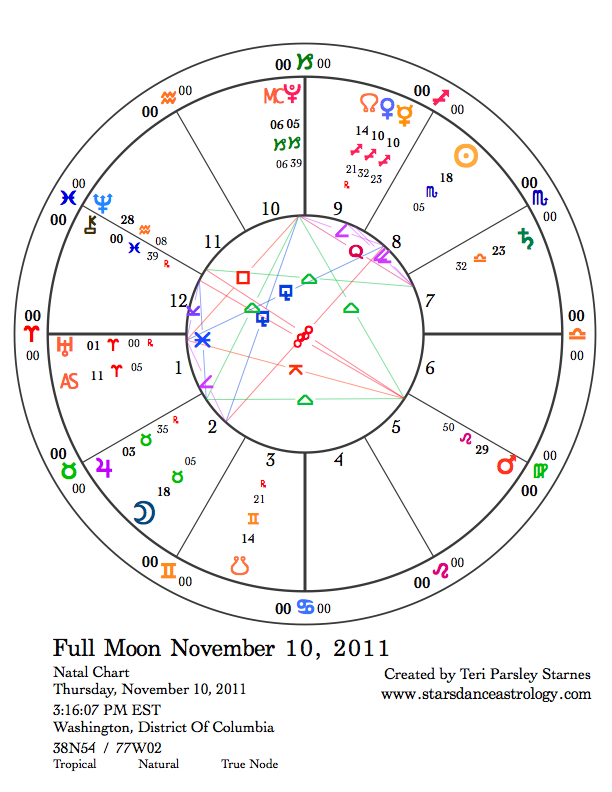 At the Full Moon, Neptune in Fixed sign, Aquarius will have just turned direct and will oppose Mars in Leo. This is Neptune’s last station in Aquarius where it has been since 1998. Mars calls attention to the fact that this era is coming to an end and another is beginning. This is a big topic, however, I imagine that this aspect at the Full Moon will include the ways we need to balance the significance of the individual with our collective longings. Certainly, we have the opportunity to open and receive new insights this month. Another mythic storyline beginning this month—Mars retrograde through Virgo. Every two years Mars turns retrograde. Because of apparent backward motion during retrograde, Mars stays in a sign much longer than usual, first transiting forward through a segment of the zodiac, stationing retrograde to go back over the same area, and then stationing direct to complete the third pass. Mars represents the heroic, valorous parts of ourselves and as this planet makes its retrograde journey, I imagine that we are all taking a hero’s journey along with Mars. I use Joseph Campbell’s model of the hero’s journey in three parts—the Call, the Journey, and the Return—to frame Mars retrogrades. This time, Mars journeys between 3 degrees Virgo and 23 degrees Virgo starting November 18 and ending on June 19, 2012. Mars is still moving direct as it enters the retrograde zone. From the 18th to January 23, 2012, we are in the first segment of the journey: the Call. During this phase, we receive indications that we are being called on an adventure that will eventually change our lives if we dare to accept. During the second phase (January 23 through April 13) of Mars retrograde, or the journey, we are tested and transformed. During the return phase (April 13 through June 19), we must integrate newfound wisdom into our lives. Anyone with planets or important points between these degrees of any Mutable sign, may feel this mythic journey strongly. However, the lessons are there for us all. These lessons center around the meaning of Virgo. Some clues. Pay attention to holistic practices that nurture body and mind. Health concerns may arise that will shift your diet or lifestyle. What are your expectations for yourself? How does perfectionism play out in your life? You may be called to refine your ability to discern what is important to you and how you must act in accordance. There may be a strong call to service or apprenticeship that will lead you on an important journey. Virgo, like all Mutable signs, is concerned with synthesizing and learning. This seven-month period will give us ample opportunity to do just that. There is a moment in every significant journey when we know we will never again be the same person who began the journey. Scorpio time is when we realize that change is the only constant. Death is the companion that gives meaning to the path.